King's Letter to the Fleet. Thanksgiving for the King's Restoration. The King to be proclaimed. Answer to the King's Letter. A LETTER from General Montague, dated, aboard the Naseby, in the Downs, the Third of May 1660; giving an Account of his Receipt of His Majesty's most gracious Declaration, dated 4/14 th Day of April, 1660; and of a Letter of the same Date, directed to General Monck and himself, to be communicated to the Fleet; was this Day read. A Copy of his Majesty's said Letter, which came inclosed in General Mountague's, was also read. Resolved, That the Generals of the Fleet have the Leave of this House, to return an Answer to his Majesty's gracious Letter and Declaration, sent to them. Resolved, That the Ministers do, on Thursday next, the Thanksgiving Day for the Cities of London and Westminster, and late Lines of Communication, return Thanks to God for his Majesty's gracious Letters and Declaration; and for the hearty, loyal, and dutiful Conjunction, and universal Concurrence of the Houses, and of all the Forces by Sea and Land, to bring in his Majesty, upon the Terms of Justice and Honour, propounded by his Majesty. Resolved, That the several and respective Ministers throughout the Kingdom of England, Scotland, and Ireland, Dominion of Wales, and Town of Berwick upon Tweed, be, and are hereby required and enjoined, publickly to pray for the King's Majesty, by the Name of Our Sovereign Lord Charles the Second, by the Grace of God, King of England, Scotland, France, and Ireland, Defender of the Faith, &c.
Ordered, That Mr. Pryn, Mr. Turner, Mr. Stephens, Col. Bowyer, Sir Trevor Williams, Mr. Charlton, Mr. Finch, Mr. Gewen, Serj. Browne, be a Committee, to word the said Two last Orders, upon this Day's Debates: And the said Committee are forthwith to withdraw, and report to the House. That the Lords Concurrence be desired herein. Mr. Pryn reports a Declaration for continuing all Sheriffs, Justices of Peace, Mayors, Constables, and other Ministers of publick Justice, that were in Office the Twenty-fifth Day of April 1660; which was read, and, after some Amendments at the Table, passed. Resolved, &c. That the Lords Concurrence be desired to this Declaration; and that the Lord President of the Council of State do carry the same to the Lords. Lord Howard reports the Names of the Members of this House, who have the greatest Number of Voices, for attending his Majesty from this House, with their Answer to his Majesty's Letter, being as followeth; viz. Sir George Booth, Lord Faulkland, Mr. Holles, Sir John Holland, Sir Anthony Ashley Cooper, Lord Bruce, Sir Horatio Townesend, Lord Herbert, Lord Castleton, Lord Fairfax, Sir Henry Cholmley, Lord Mandevill. Resolved, &c. That Sir George Booth do go, as one of the Messengers from this House, with their Answer to his Majesty's Letter. Resolved, That the Lord Faulkland do go, as one of the Messengers from this House, with their Answer to his Majesty's Letter. Resolved, That Mr. Holles do go, as one of the Messengers from this House, with their Answer to his Majesty's Letter. Resolved, That Sir John Holland do go, as one of the Messengers from this House, with their Answer to his Majesty's Letter. Resolved, That Sir Anthony Ashley Cooper do go, as one of the Messengers from this House, with their Answer to his Majesty's Letter. Resolved, That the Lord Bruce do go, as one of the Messengers from this House, with their Answer to his Majesty's Letter. Resolved, That Sir Horatio Townesend do go, as one of the Messengers from this House, with their Answer to his Majesty's Letter. Resolved, That the Lord Herbert do go, as one of the Messengers from this House, with their Answer to his Majesty's Letter. Resolved, That the Lord Castleton do go, as one of the Messengers from this House, with their Answer to his Majesty's Letter. Resolved, That the Lord Fairfax do go, as one of the Messengers from this House, with their Answer to his Majesty. Resolved, That Sir Henry Cholmley do go, as one of the Messengers from this House, with their Answer to his Majesty. Resolved, That the Lord Mandevill do go, as one of the Messengers from this House, with their Answer to his Majesty. Resolved, That Mr. Bowles have the Leave of this House to go with the Messengers, who are to attend the King's Majesty from this House, with their Answer to his Majesty's Letter, as their Chaplain. Mr. Speaker, The Lords desire the Concurrence of this Honourable House to this Order:-And therewith delivered in an Order, which was read; and was, For Stay of Delivery of the Possession to any of the Purchasers of the Manor of Chedley, and other the Manors and Lands called the Brooke's Lands, late the Lands of John Lord Marquis of Winchester; and to stop Wastes and Spoils thereupon; and for staying the Rents in the Tenants Hands. Resolved, That this House will send an Answer to this Message, by Messengers of their own. Gentlemen, The House have considered of your Message, and the Order which you brought from the Lords; and they will return an Answer by Messengers of their own. Mr. Recorder of London reports an Ordinance for an Assessment of Seventy thousand Pounds by the Month, for Three Months, to be set upon England, to commence from the Twenty-fourth Day of June, 1660; which was this Day read the first Time. The Lord President of the Council of State brings Answer from the Lords, That the Lords have agreed to the Declaration for continuing Sheriffs, and other Ministers of Justice, as was desired by this House. Ordered, That this Declaration be forthwith printed and published. The Ordinance for an Assessment of Seventy thousand Pounds by the Month, to be set upon England, &c. for Three Months, was this Day read the Second Time; and, upon the Question, committed unto Sir Dudley North, Sir Wm. Wheeler, Sir Wm. Lewis, Mr. Recorder of London, Mr. Pryn, Colonel Bowyer, Serj. Maynard, Sir John Northcot, Mr. Stephens, Lord Bruce, Mr. Goodrick, Sir Tho. Wroth, Lord Bulkley, Ld. Commissioner Widdrington, Mr. Turner, Sir John Carter, Mr. Mildmay, Sir Richard Temple, Mr. Robinson, Mr. Annesley, Sir Anthony Irby, Sir Trevor Williams, Mr. Swayle, Alderman Bloudworth, Mr. Tolson, Sir Richard Onslow, Lord Falkland, Mr. Boderda, Mr. Finch, Ld. Howard, Sir Geo. Booth, Mr. Lloyd, Mr. Knightley, Mr. Baynham, Col. King, Ld. Anger, Sir Gilbert Gerrard, Col. Rouse, Mr. Holles, Sir Anthony Ashley Cooper, Mr. Francis Gerrard, Col. Fitz James, Mr. Chaffe, Mr. Lancelot Lake, Mr. Sylly, Mr. Roberts, Mr. Gewen, Mr. Milborne, Mr. Rainsford, Mr. Serj. Glyn, Sir Henry Yelverton, Mr. Clapham; and all that come to have Voices: And that the Knights, Citizens, and Burgesses, who serve for the respective Counties, Cities, and Boroughs, do, this Afternoon, give in to the said Committee the Names of Commissioners for the Assessments for the respective Counties, Cities and Boroughs: And are to meet in the Exchequer Chamber, at Three of the Clock this Afternoon: And that Mr. Recorder of London do take care hereof. Resolved, That the Proportions, in this Bill, be according to the Proportions in the last Bill of Assessments; provided that these Proportions shall not be drawn into Precedent for the future. Mr. Finch reports several Votes, worded by the Committee appointed to withdraw; which Votes were read, and, upon the Question, agreed unto; and are as followeth; viz. Resolved, That all and every the Ministers throughout the Kingdoms of England and Ireland, Dominion of Wales, and Town of Berwick upon Tweed, do, and are hereby required and enjoined, in their publick Prayers, to pray for the King's most Excellent Majesty, by the Name of our Sovereign Lord Charles, by the Grace of God, of England, Scotland, France and Ireland, King, Defender of the Faith, &c. and for the most illustrious Prince James Duke of Yorke, and the rest of the Royal Progeny. Resolved, That the Ministers who are appointed to officiate before this House upon Thursday next, being the Day appointed for a publick Thanksgiving; and all other Ministers within the late Lines of Communication, who, in their several Churches and Chapels, are to carry on the Duties of that Day; and also all other Ministers who are, on that Day Fortnight, to perform the like Duty throughout the Kingdom of England, and Dominion of Walles, and Town of Berwick upon Tweed; shall be and are hereby enjoined to return Thanks to Almighty God, for his Majesty's several gracious Letters to both Houses of Parliament, and to the Commanders in Chief of the Forces both by Land and Sea, and to the Lord Mayor and Common Council of the City of London, together with the Declarations inclosed; and the just and honourable Concessions therein contained; and for the hearty, loyal, and dutiful Conjunction of the Lords and Commons, now assembled in Parliament; and the universal Concurrence of all the Commanders and Forces both by Land and Sea, to receive his Majesty into his Dominions and Government, according to their bounden Duty, and the Laws of the Land: And that the Ministers, upon Thursday Fortnight, be enjoined to read his Majesty's Letters and Declarations to both Houses, in their several Churches and Chapels, at the same time. Resolved, That the Concurrence of the Lords be desired to these Votes. Resolved, That it be recommended by this House to the Ministers in the several Parishes within the Cities of London and Westminster, and late Lines of Communication; that there be a charitable Collection made in their several Congregations, upon Thursday next, being set apart for a Day of Thanksgiving, for Relief of the poor, sick, maimed Soldiers, Widows, Orphans, and Pensioners, at the Hospitals of the Savoy and Ely House. 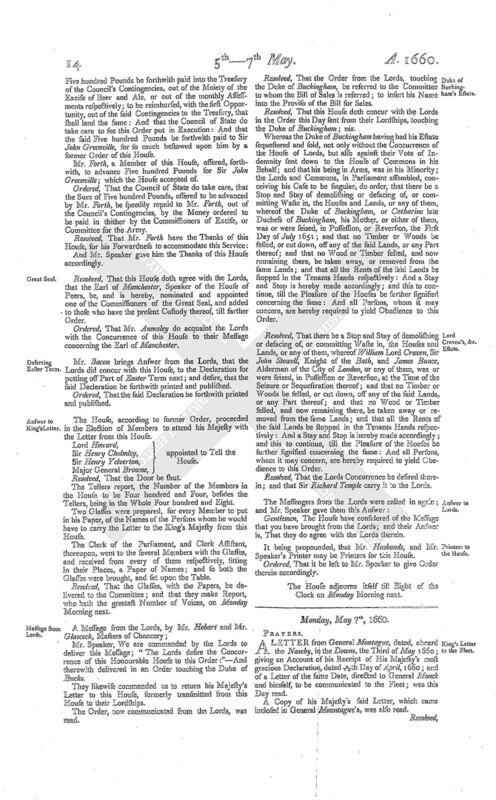 Mr. Speaker, The Lords have commanded us to tell you, that their Lordships have made an Order for proclaiming of his Majesty, King of England, Scotland, France, and Ireland; and have agreed on a Committee of Four Lords; desiring a proportionable Number of this House may be appointed to meet with them, at Four of the Clock this Afternoon, in the Prince's Lodgings; to consider of the Manner, Time, and other Circumstances, to be observed therein. Resolved, That this House doth agree with the Lords in the said Message. Resolved, That Mr. Pryn, Mr. Turner, Mr. Stephens, Col. Bowyer, Sir Trevor Williams, Mr. Charlton, Mr. Finch, Mr. Gewen, be the Committee, to meet with the Committee of the Lords accordingly. Gentlemen, The House have considered of the Message and Order sent from the Lords concerning the Proclaiming of the King; and have appointed a proportionable Number of themselves, to meet with the Committee appointed by the Lords, at the Time and Place mentioned, according as is desired. 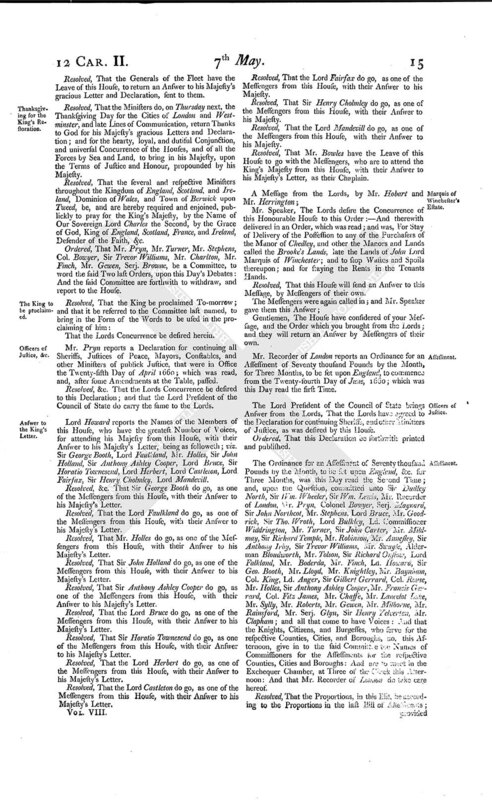 Mr. Speaker, The Lords have commanded us to attend you with the Bill for Removal and Preventing all Questions and Disputes concerning the Assembling and Sitting of this present Parliament; to which they have added a Proviso, and made some Amendments; to which their Lordships desire the Concurrence of this House. The Proviso and Amendments were read the first, second, and third time; and are as followeth; viz. Line 17, after the Word "Parliament," and before the Word "Provided," add these Words, "Provided always, that this present Parliament may be dissolved by his Majesty, after the usual Manner, as if the same had been summoned by Writ or Writs in his Majesty's Name." In the same seventeenth Line, after the Word "Provided," and before the Word "And," instead of the Word "always," put in the Word "also." Resolved, That this House doth agree with the Lords; and that the said Proviso and Amendment be Part of the Bill. Gentlemen, The House have considered of your Message from the Lords; and have agreed to the Proviso and Amendments by them offered to be Part of the Bill. 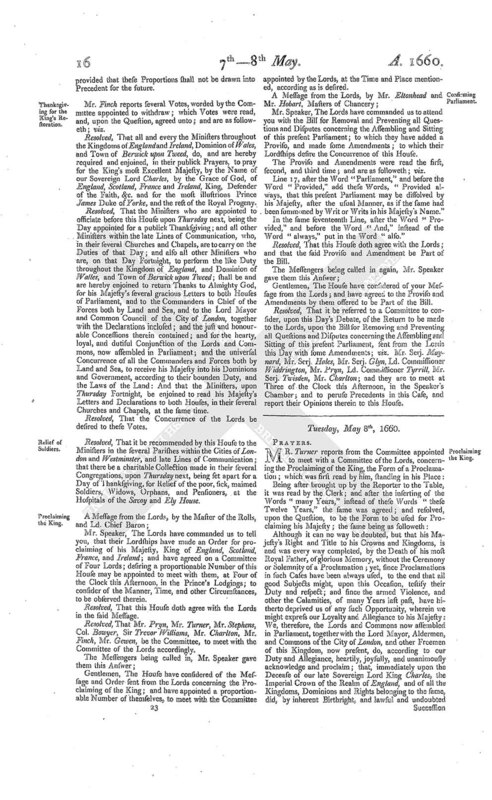 Resolved, That it be referred to a Committee to consider, upon this Day's Debate, of the Return to be made to the Lords, upon the Bill for Removing and Preventing all Questions and Disputes concerning the Assembling and Sitting of this present Parliament, sent from the Lords this Day with some Amendments; viz. Mr. Serj. Maynard, Mr. Serj. Hales, Mr. Serj. Glyn, Ld. Commissioner Widdrington, Mr. Pryn, Ld. Commissioner Tyrrill, Mr. Serj. Twisden, Mr. Charlton; and they are to meet at Three of the Clock this Afternoon, in the Speaker's Chamber; and to peruse Precedents in this Case, and report their Opinions therein to this House.